Professional horse facility. Home location on property is very private and the views are incredible. Home has 4 large bedrooms, great room, with the kitchen open to to the great room. Bathrooms are also large. Its a very comfortable home for the family. There are 2 barns with concrete breezeway floors, and 2 mare motels. Huge arena, round pen, 6 horse hot walker. Property is fully perimeter fenced with cedar stays, and there are 5 pasture shades. Heavy duty fencing around mare motel and cattlepen. 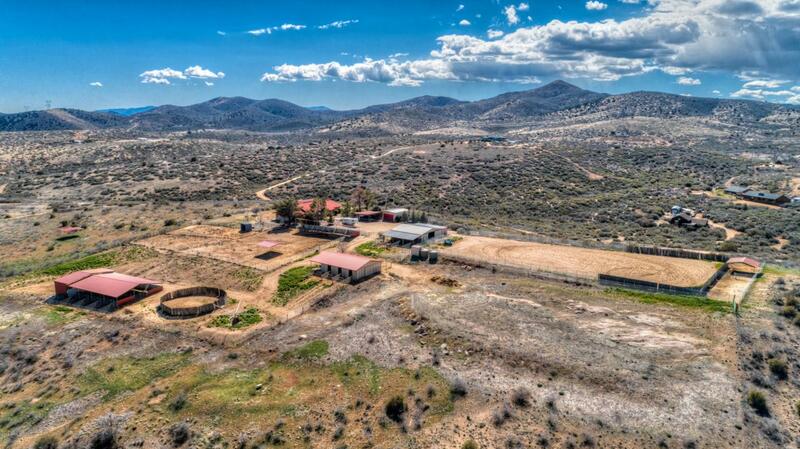 Property is adjacent to Prescott National Forest and has a gate going right into that National Forest for endless wonderful trail riding. There is also a 2 car garage and 2 2 car carports. 2 wells on property but only 1 is used.